What makes mobile massage therapist such an amazing job? 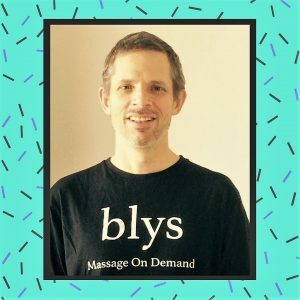 Eric, one of our Blys team’s regular therapists, joined our Therapist Hub to share his experience working in the mobile massage industry. What first made you want to become a massage therapist? It was more than 20 years ago, so my memory is a bit faded, but it involves touch and helping, and those two things in massage work really nicely! Tell us a little bit about yourself; where are you from, what brought you to Sydney, how long have you been here? I’m very driven and entrepreneurial (both have met with failures and successes) and the implementing of ideas is a real joy to me. I’m currently juggling study, massage work and being a dad, so my social life revolves solely around two people (partner and kid). Being a dad is really wonderful, but extremely tiring! I’m originally from the USA (born in Reno, NV), and came here when I was two, as my dad got a teaching job here. I have stayed, with gaps of overseas living, in Australia since. That someone looks fantastic afterwards; I gave them a chance to sleep; they learn more about their body; the happiness in seeing you without even knowing who you are! But a big joy (mostly) is getting to each job and back. I take my table on public transport, and I never have an alone moment on trains. Recently have had a lot of concerned eastern European old women think I am straining myself picking up a *very heavy* table. I feel I am a backpacker all over again, and I don’t even have to leave Sydney. Plus I get to walk around suburbs I would never walk around voluntarily. Sometimes at night, its a beautiful scene in many places in Sydney. You just don’t get it driving a car. What has been the highlight of your massage therapist career so far? Teaching people massage has been a wonderful experience. As for a highlight, I feel massage works incrementally, and before you know it, you’re doing things you didn’t know you knew! I learn off every massage I give to someone, and I definitely learn of each massage I receive. What’s the best compliment you’ve ever received after a massage? Last night: “this is the best massage I have ever received!”. To me, that really is the best compliment I can receive. I have literally done better than every other therapist she has been with. I like that. Now, that depends on my mood. I can walk the streets of Neutral Bay when I’m in a quiet mood; Crown Street, Darlinghurst when I’m in a hipster mood; Oxford Falls when I want to feel I am in the country; Lane Cove when I want to see what I could buy for a house one day. What has your experience with Blys been like so far? The biggest experience is the amount of work: Blys is by far the most popular mobile massage service. The fact that I can pay all my bills by the end of the weekend and feel I only did a bit of work is proof that being a regular massage therapist is just about the best job I have ever had. What advice would you give an aspiring massage therapist? Development of empathy and real connected touch is what makes a good massage. That is, you use the whole of your hand to make contact, you listen intently to the contours of the client’s muscles (which means you slow down), and you interact with each part of that muscle you are on. That the client knows you are listening and tuning into them, is what makes the massage special. On top of your main knowledge of course. Thanks for the very interesting interview, Eric!